The Jets are releasing running back De’Angelo Henderson, Manish Mehta of the Daily News (on Twitter) hears. That’s a strong indication that fellow tailback Eli McGuire will return to face the Dolphins on Sunday. Henderson, 26 later this month, was a sixth-round pick of the Broncos last year and appeared in a handful of games as a rookie. He joined the Jets’ practice squad after missing Denver’s final cut and earned a promotion to the main roster after Bilal Powell was lost for the year. He did not see the field against the Bears on Sunday, so his brief Jets stint will end without an official statistic recorded. It stands to reason that the Jets may re-sign him to the practice squad if he clears waivers, however. The Jets’ primary rusher on Sunday will be Isaiah Crowell with sixth-round pick Trenton Cannon and (probably) McGuire in reserve. The Ravens were expecting big things from defensive tackle Willie Henry this season, but they may have to wait a few weeks to see him contribute. Head coach John Harbaugh said on Saturday that the 24-year-old recently underwent surgery to repair an umbilical hernia. “It’s not football related, but maybe had been there and just kind of opened up on him a little bit. He had surgery for that, so he’ll be a few weeks,” Harbaugh said (via Ryan Mink of BaltimoreRavens.com). After sitting out his entire rookie campaign, the 2016 fourth-round pick showed some promise in 2017 after sitting out his entire rookie campaign. In 14 games (three starts), Henry compiled 33 tackles, 3.5 sacks, and five passes defended. With Henry out of the starting lineup, the Ravens will likely turn to Chris Wormley or rookie Zach Sieler. Henry won’t be the only Ravens player forced out of the lineup. Harbaugh also said tight end Hayden Hurst recently had surgery to repair a stress fracture in his foot, and recovery could take three to four weeks. Olivier Vernon was carted off the Giants practice field today after suffering a left ankle injury. However, it sounds like the talented outside linebacker will be alright, as ESPN’s Josina Anderson reports (via Twitter) that Vernon’s x-rays came back negative. If the 27-year-old is forced to miss any time, it’d be a big loss for the Giants. The linebacker has compiled 15 sacks in two seasons with the team, including a 2017 campaign when he collected 37 tackles and 6.5 sacks in 12 games. Vikings center Pat Elflein is currently dealing with shoulder and ankle injuries, but head coach Mike Zimmer recently said that the lineman wouldn’t begin the season on the PUP list. However, that might not end up being the case. Chris Tomasson of St. Paul Pioneer Press tweets that the organization is set to get a medical update on Elflein tomorrow. According to the reporter, the team now isn’t expecting the lineman to be ready for the start of the regular season. The center started all 14 games as a rookie last season. The Vikings recently traded for Brett Jones for some reinforcement at the position. 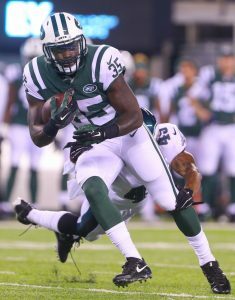 Jets running back Elijah McGuire won’t be ready for the start of the regular season, tweets Ralph Vacchiano of SNY. Head coach Todd Bowles acknowledged that the team is considering placing the 24-year-old on the short-term injured reserve to start the year. McGuire looked solid during his rookie season, compiling 315 rushing yards and one touchdown on 88 carries (he also hauled in 17 catches for 177 yards and one score). The running back’s injury may allow the team to hold onto another player at the position behind Isaiah Crowell, Bilal Powell, and Thomas Rawls. The Jets have signed George Atkinson III, per Brian Costello of the New York Post (via Twitter). Atkinson, a running back by trade, has gotten just seven carries in his professional career. He has been deployed more frequently as a punt returner, seeing action in 2014 with the Raiders and 2016 with the Browns (his seven carries came with Cleveland). He did not log any regular season snaps last year, though he spent some time on the Chiefs’ practice squad. Atkinson will presumably operate as a temporary replacement for running back Elijah McGuire. As Adam Schefter of ESPN.com reports (via Twitter), McGuire will undergo surgery on his broken foot and will be sidelined for three to six weeks. Rich Cimini of ESPN.com tweets that the team will have to decide whether it wants to carry McGuire on the 53-man roster or place him on short-term IR. In the wake of McGuire’s injury, Gang Green quickly set up visits with free agent running backs Orleans Darkwa and Alfred Morris yesterday, but Ian Rapoport of NFL.com tweeted earlier this morning that the Jets were not expected to immediately sign either player, and the Atkinson signing seems to foreclose the addition of Darkwa or Morris. Cimini notes that the Jets also worked out running back Tion Green (Twitter link). Darkwa, Morris, and even Green have more experience as an NFL running back than Atkinson, so perhaps the fact that the Jets signed Atkinson suggests that they expect McGuire to be back sooner rather than later. McGuire, a 2017 sixth-rounder, is a player that the Jets have high hopes for, and assuming he gets healthy, he should see his fair share of snaps, even with Isaiah Crowell and Bilal Powell also under contract. To make room for Atkinson, the Jets cut TE Bucky Hodges. 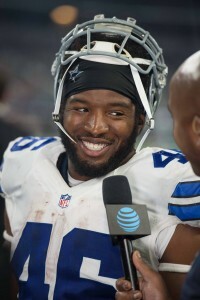 The Jets are taking a look at the running back market on Saturday, with Alfred Morris arriving for a visit, Ian Rapoport of NFL.com tweets. It’s been a quiet offseason for the former Redskins starter and Cowboys depth piece. This is Morris’ first known visit in 2018. While Morris is now 29, he should be relatively fresh after being Ezekiel Elliott‘s backup for most of the past two seasons. The Jets let Matt Forte walk in the offseason but added Isaiah Crowell to their backfield mix. New York also has Bilal Powell, Elijah McGuire and former Seahawks starter Thomas Rawls under contract. McGuire left Friday’s Jets practice with a foot injury, however. And Rapoport reports this is a serious malady. McGuire fractured his foot and will undergo surgery, Rapoport tweets. The second-year back will miss an extended time period and looks set for IR. This may not be a season-ending setback, though, with Rapoport adding an IR-return slot may be possible in this case. But that will depend on the Jets’ injury situation this season, since teams are limited to two IR-return players per season. Serving as a backup to Forte and Powell, McGuire rushed for 315 yards (3.6 per carry) as a rookie. Morris, though, looked spry with the 2017 Cowboys, averaging a career-best 4.8 yards per carry. That came on 115 totes after Morris received just 69 in 2016. Elliott’s suspension increasing Morris’ workload, the veteran gained 547 yards on the ground and scored a touchdown last season. The Jets inked two sixth-round picks, Louisiana-Lafayette running back Elijah McGuire and Mississippi cornerback Derrick Jones, to their rookie deals, tweets Brian Costello of the New York Post. McGuire (No. 188) and Jones (No. 204) are the first members of Gang Green’s nine-player class to sign. Patriots sixth-round offensive tackle Conor McDermott has put pen to paper, per ESPN’s Field Yates (on Twitter). At No. 211, the ex-UCLA Bruin was the final selection last weekend for New England, which only had four picks. The other three haven’t signed yet.